Do you dread back-to-school shopping? Perhaps you have kids like mine who loathe trying on clothes and shoes? My beloved Lithuanian grandmother, a former New York city model and savvy shopper, always made my back-to-school shopping trips to Seattle’s big department stores a special event. Inspired by her, I’ve learned to rock the shopping season with my own kids. Here are tips on where to find fashion, fun and fabulous food at Puget Sound area shopping centers, even if you have “reluctant shoppers” like I do. Note: We of course only provide a sampling of the fun places to shop around Seattle. Also see ParentMap's Golden Teddy Awards or ParentMap directory for great information on where to shop for kids' clothing and shoes, shopping centers, consignment stores and more. Crossroads has been one of my family’s favorite places to eat, shop and play. When my son and daughter were younger, they rode the shopping center’s vintage kid rides countless times. They both had their first haircuts at the Crossroads Kids Salon. We frequently shop on Tuesdays for produce, flowers and snacks at the summer Crossroads Farmers Market. Now teenagers, my kids still enjoy meeting friends at the food court or the nearby movie theater. Back-to-school shopping at Crossroads is always fun and affordable. 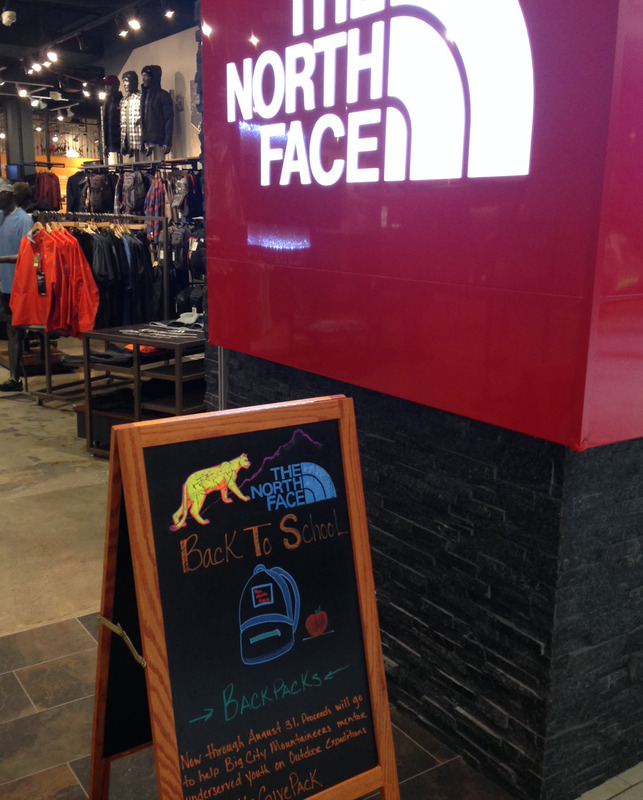 You’ll find back-to-school clothing at stores including Old Navy, Dress Barn and Sports Authority. Daiso Japan is a great resource for unique school supplies. Also shop for school supplies at Michael’s. Half Price Books and Barnes and Noble offers reference books and cool back-to-school accessories. You can always find active fun at Crossroads, including rock climbing at Stone Gardens, family board game time at Uncle’s Games every Sunday from 11 a.m. to 6 p.m., indoor fun for all kids under 48 inches tall at WiggleWorks Kids expanded playscape or paint-your-own pottery at Creatively Yours. Play with a giant chessboard at the shopping center’s Game Lane. Visit on a Thursday, Friday or Saturday night and enjoy live music (second Saturdays each month are family-friendly with performances geared for kids, family game time from 5–7 p.m. at Game Lane. $1.50 off admission to WiggleWorks and more). 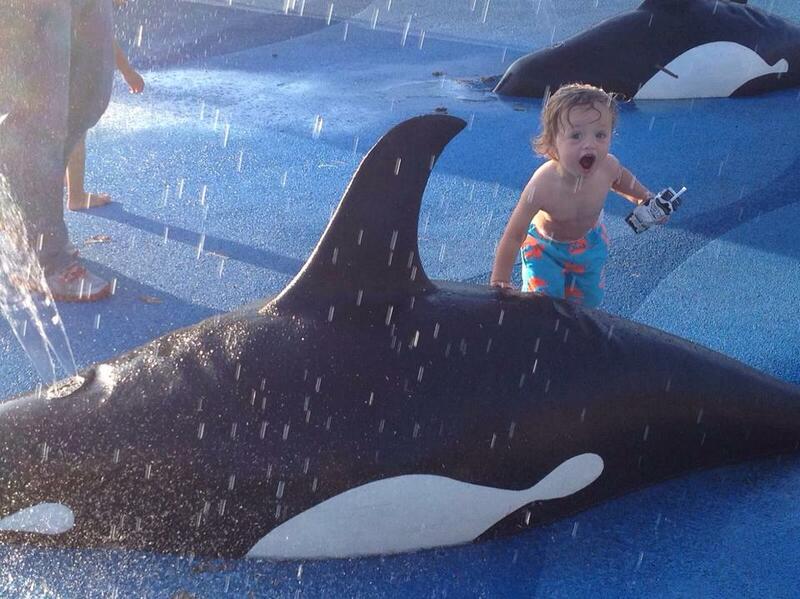 Nearby popular Crossroads Park offers a spray park and playground that young kids love. The Public Market International Food Court at Crossroads offers a variety of affordable and fast meal options including Thai, Indian and Greek. In addition, sit-down table service is available at several restaurants including Tutta Bella and Oh! India. Find cold treats at Peaks Frozen Yogurt and Cold Stone Creamery, or browse Candy Tyme which boasts the most complete line of bulk candy found anywhere on the West Coast. Crossroads does not offer upscale, swanky shopping or an abundance of shoe and clothing stores (a pro for some, con for others). I love seeing that little kids still splash around Redmond Town Center’s fountain on a hot day as my kids did when they were little. My son still loves a trip here to visit Uncle's Games and Cow Chip Cookies and some of my teen daughter’s favorite stores to shop are here as well. Shop for preschoolers and elementary age kids at stores including Jack and Jane, head to REI for great rain gear and backpacks and to Claire’s for great accessories. Tweens and teens love to shop here at Charming Charlie for on trend, affordable jewelry, as well as Gap, Lucy Activewear, American Eagle Outfitters, Macy’s and Zumiez. Splashing around Redmond Town Center's fountains on its now pedestrian-friendly plaza is always fun on a hot day. Uncle’s Games offers free events including a popular Tuesday-night Pokemon League meet-up and Open Game Night Friday evenings. Creative kids enjoy painting ceramics at Paint Away! and the drop-in art events at VALA Art Center. For tots under 48 inches visit the new indoor playground Giggle Jungle. 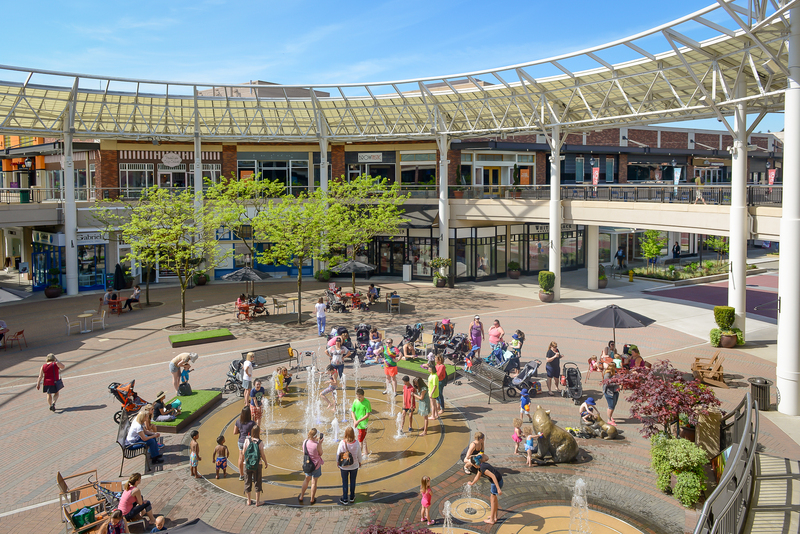 Redmond Town Center offers special spots for parents with strollers in the parking lot closest to Coldstone Creamery. When you are done shopping enjoy the playground and bike trails of Marymoor Park or take the kids swimming at Sammamish Landing Beach park, located on East Lake Sammamish Parkway with a new parking lot right across from the entrance to the park. Meal options here that kids enjoy include Pallino, Red Robin, Fatburger, and delicious kid-pleasing pasta and pizza at Spazzo. Expand everyone’s palate by tasting some of the offerings at the ethnic eateries. Find a sweet treat at Baskin and Robbins, Pinkabella Cupcakes, Red Mango, Cow Chip Cookies or Coldstone Ice Creamery. If you have a toddler, as I did, who tends to “break away and run” be aware that Redmond Town Center is an outdoor shopping center with lots of car traffic running through most of the shopping area. 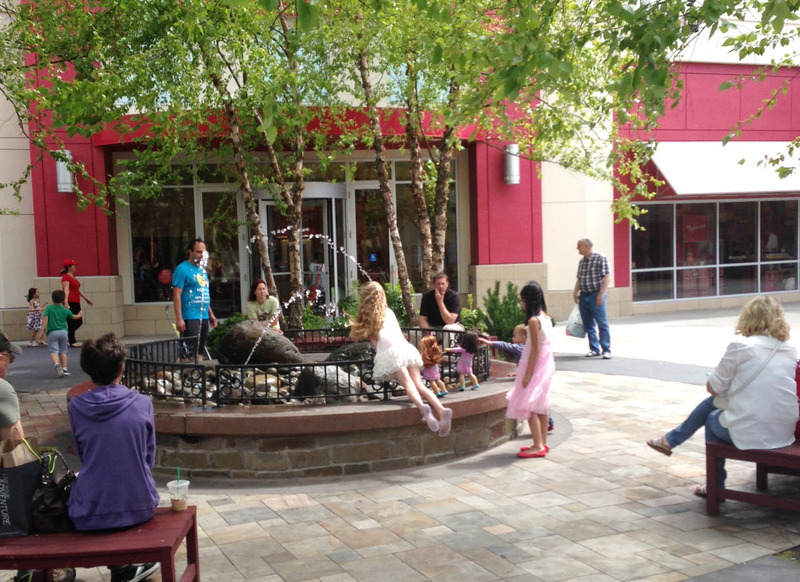 University Village is a very popular outdoor shopping center with a youthful vibe. Located near the University of Washington campus, it draws families from all over Seattle for back-to-school shopping with an abundance of store choices, great dining options and fun activities for kids. Tweens and teens also love hanging out here and shopping alongside the UW students they may aspire to be one day. Appealing back-to-school outfits for kids ages 4 to 12 can be found at Hanna Andersson, Gap Kids and Peek Kids. Kids Club offers a small selection of clothing and outerwear (alongside a large selection of toys) and a chance to get a school-picture-ready haircut at the in-store salon. Tweens and teens love to shop at American Eagle Outfitters, H&M, Free People, ivivva athletica (lululemon's little sister) and Madewell. Find great shoe options at Sole Food and Nike Running. Find cool pens and other fun back-to-school supplies at Impress and the Paper Source. Shop for all your student’s technology needs at the Microsoft and Apple stores; and the new Amazon Bookstore offers books at the same prices as amazon.com, as well as opportunities to test-drive its devices. Younger kids love the shopping center’s covered (and enclosed) playground. You can drop by Paint the Town for a break from shopping to decorate a piece of pottery. There are also fountains near the playground where kids can cool off on a hot day. Further afield, you can take your tween or teen on a walking tour of the UW campus to inspire him or her to study harder this year. Got a tea-loving princess? Make a reservation at the nearby Queen Mary Tea Room for their special tea service just for kids. Or for your pirate-in-training, head to the UW Waterfront activity center and rent a canoe to paddle together. Great dining options at University Village include Elemental Pizza (kids can play with pizza dough while you wait), Eureka! and Din Tai Fung for yummy dumplings (expect lines, but you can take a beeper and head to the playground). For a sweet snack head to Molly Moon’s for swoonworthy ice cream, Menchie's for frozen yogurt with all the fixin's or Trophy Cupcakes. Parking is scarce almost any day at the University Village. Try shopping early or late and a good strategy is to head straight to the new parking garages, where you can usually find plenty of free parking. Westfield Southcenter knows how to make families happy. In addition to a great selection of stores, the shopping center has a great area for kids that includes the new Lego Store, a Pokemon vending machine, play area and a fun bowling center and arcade. For kids ages 6 to 14, you’ll find great back-to-school clothing options at The Children’s Place, The Disney Store, Crazy 8 and Justice. Tweens and teens enjoy shopping at Abercrombie & Finch, Just Sports, PacSun, Zumiez, American Eagle Outfitters, Aeropostale, Hollister and Topshop. Older kids will find great fashion finds at H&M, JCPenny, Macy’s and Nordstorm. Snag stylish shoes at Champs Sports, Journeys Kidz, Vans, Skechers and Kids Foot Locker. Daiso Japan offers inexpensive and fun school supply options and you can meet all your student’s tech needs at the Apple and Microsoft stores. Westfield Southcenter offers many fun activities to take a break from shopping including the new Round 1 Bowling and Amusement center. 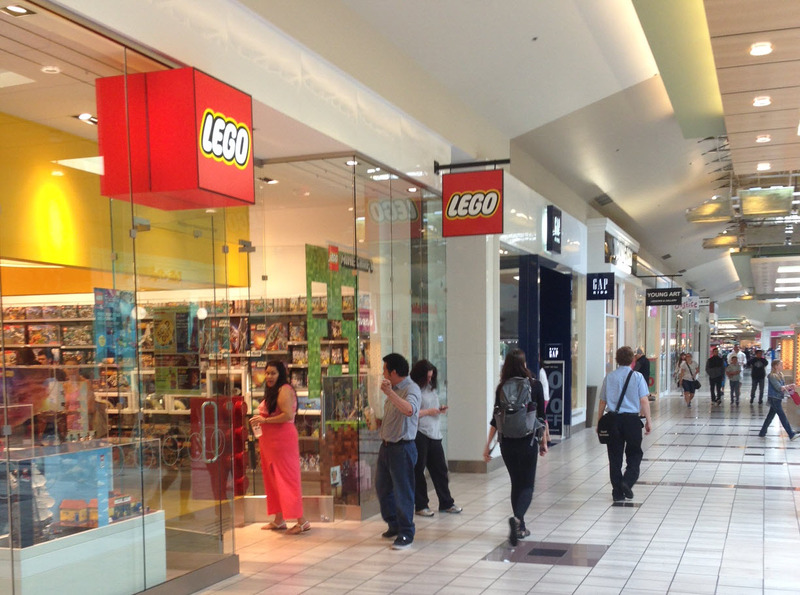 Take your Lego fans to the Lego Store to play for free at the store’s activity stations. 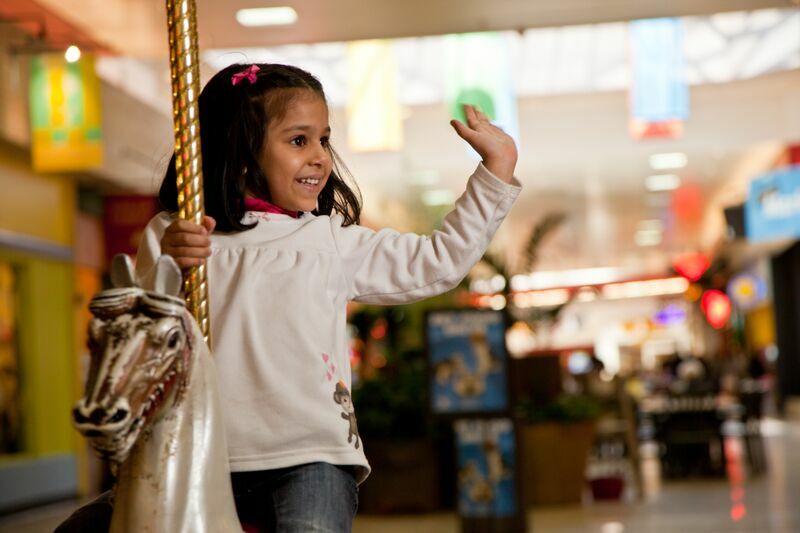 Little kids love the shopping center’s PlaySpace and there is also a movie theater on site. Parents with small kids love the shopping center’s Family Lounge where you’ll find toys, baby-changing stations and private nursing areas. Families also enjoy visiting the shopping center’s King County Library System branch where you can chill with books. Kid-pleasing options include The Cheesecake Factory, Johnny Rockets for burgers, Blue C Sushi and Ivar's and Duke's Chowder House. Head to Jollibee to try the Phillipines most popular fast food restaurant. Try the Chickenjoy and then the Halo-halo for a sweet treat. Other snack options include Potato Corner for hearty baked potatoes and sweet potato fries, Ben and Jerry's and Unicone Crepes. 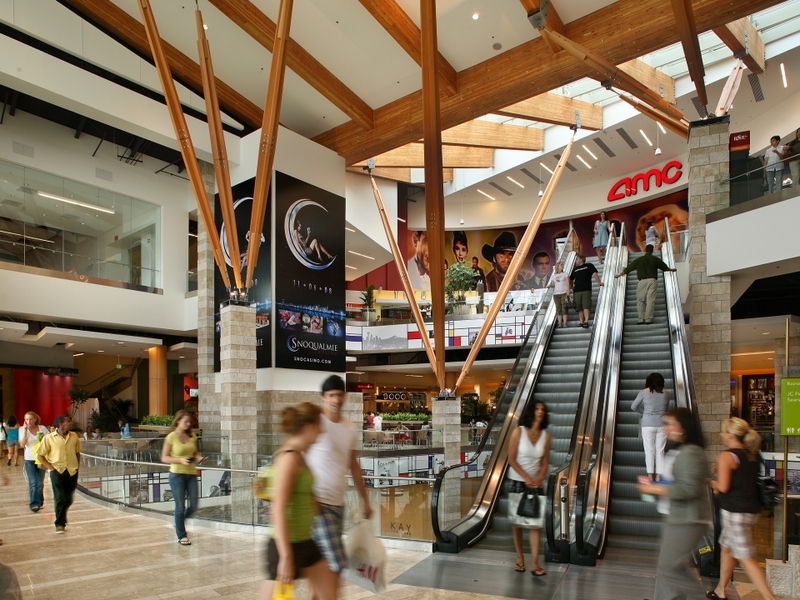 Westfield Southcenter is so big that you should pre-plan so that you park nearest the stores you’ll be shopping at the most. This once tired-around-the-edges shopping center has been transformed over the past decade to a highly popular shopping destination with the addition of a “California style” outdoor shopping park as well as new stores. Girls love to dance with their new doll friends around the fountain outside the American Girl store. Teens hang out nearby at the Apple Store in packs. And parents appreciate the abundance of shopping choices. 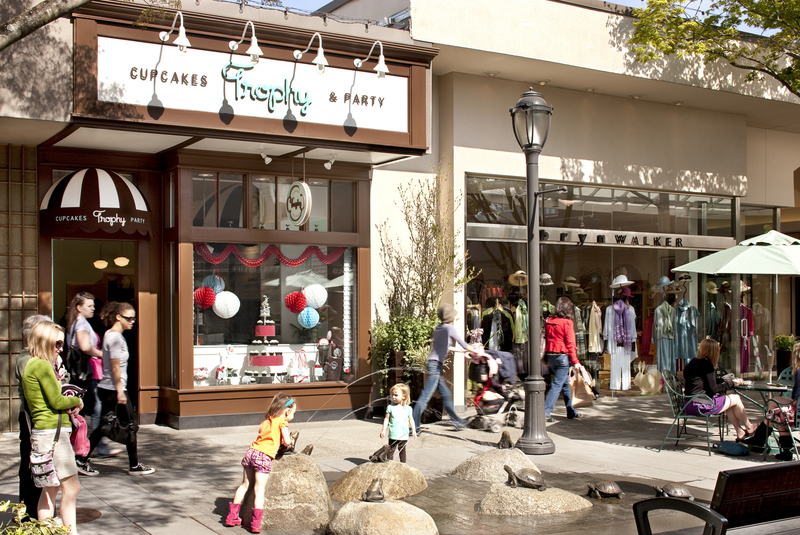 Shops aimed at the younger crowd include: Gap Kids, Gymboree and Abercrombie Kids. Hot spots for teens and tweens include Apple, H&M, Pink and Nordstrom. Head to the “teen block” right before the food court and you’ll find edgy shops for teen T-shirts, backpacks and even hats at stores including Lids, Journeys, Hot Topic, Urban Outfitters, PacSun, Spencer's and Zumiez. Alderwood offers options for younger kids to have fun, including the super-popular American Girl store, The LEGO store, Build A Bear, and Tot Lot play area. 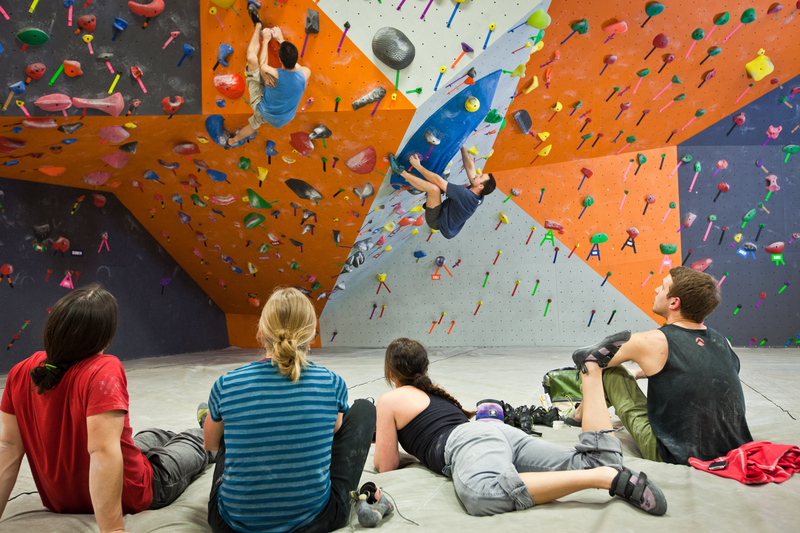 Take active kids over to REI on a weekend, noon to four, where they can climb the giant climbing structure inside the store ($5 REI member, $20 non members). Be aware the climbing wall may be closed during sales. Need onsite childcare so you can take a break? Check out the new Young Art Lessons and Gallery near Sears which offers drop in art classes. Alderwood’s food court The Terraces offers many options, including pasta and pizza, seafood, sandwiches, Indian, Greek and Thai. Ask about “kid specials.” If you prefer table service, check out the Blazing Onion for burgers, Blue C Sushi or P.F. Changs. For a sweet end to your shopping trip try Cinnabon, Coldstone Creamery, Cool Bliss or KuKuRuZa Gourmet Popcorn. The biggest challenge at Alderwood is parking. Go during the week, early or late if you don’t like to battle for a spot or head to the elevated parking lot across from Nordstroms. The abundance of on-trend upscale shopping options plus the addition of movie, dining, shopping and recreation options continue to earn The Bellevue Collection (made up of Bellevue Square, Bellevue Place and Lincoln Square) its well deserved reputation as a highly desired shopping destination. The pre-K crowd enjoys shopping here at Janie & Jack, Hanna Andersson, Gap Kids and Gymboree. Parents of elementary-age kids like ivivva for active wear and accessories for girls, as well as Gap, PacSun, Macy’s, Nordstrom and Claire’s. Tweens and teens enjoy shopping at Forever 21, Lorna Jane, Lucky Brand, Urbanity, Buckle, PacSun, Vans, Fuego, Lululemon and the new Zara and Uniqlo. You can borrow a complimentary stroller located by in the elevators in the garages as you enter the shopping centers. 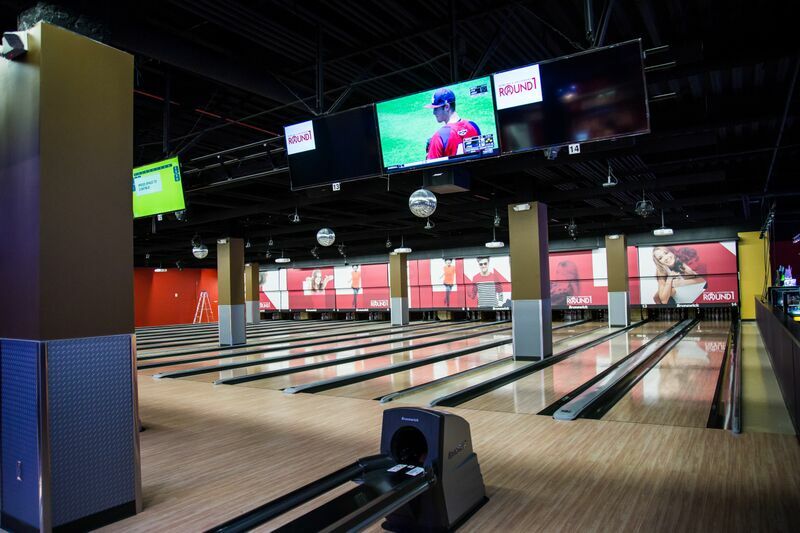 Head over to Lincoln Square for a movie or a bowling break at Lucky Strike. Got a builder? Check out the 3-D printer at the Microsoft store or hit the Lego Store. 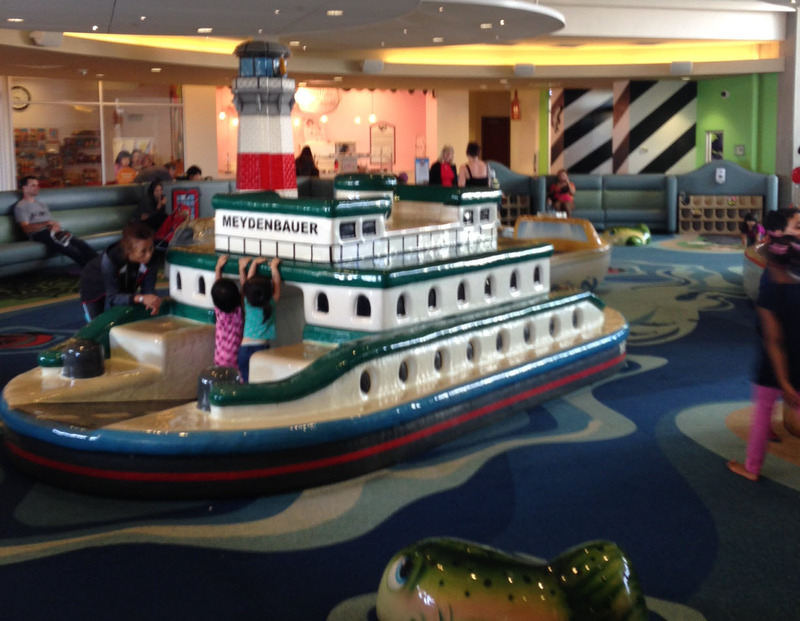 For some active play, if your child is under 42 inches in height, visit the Kid's Cove on the third floor. Get your Disney fan to the mall early and he or she can help open the Disney Store with a special key. 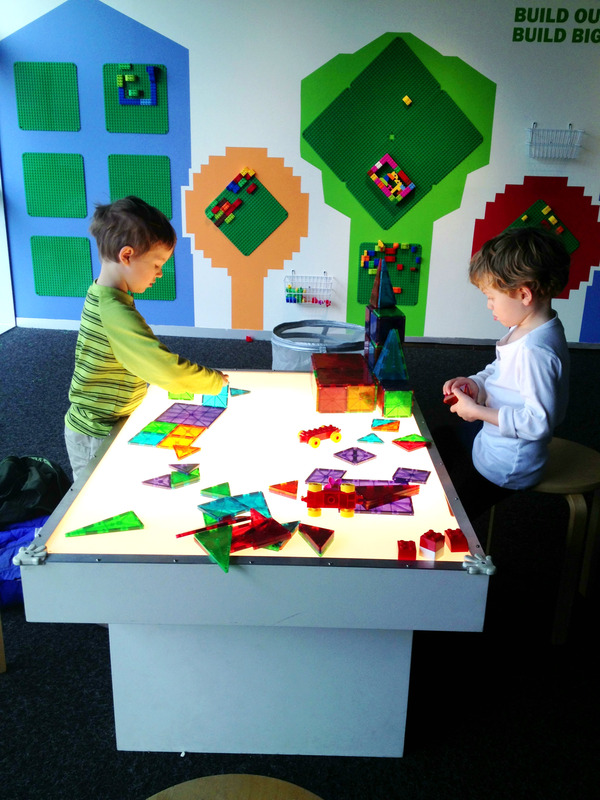 A visit to Bellevue Arts Museum (BAM) across the street is a great way to take a break from the crowds and engage your family in art. And every Friday through November, BAM offers a free art class for teens (4–7 p.m.), in partnership with the GAGE academy. Preregister online. Hungry? Make a beeline to Beecher’s Handmade Cheese, where your kids will love their famous mac and cheese. 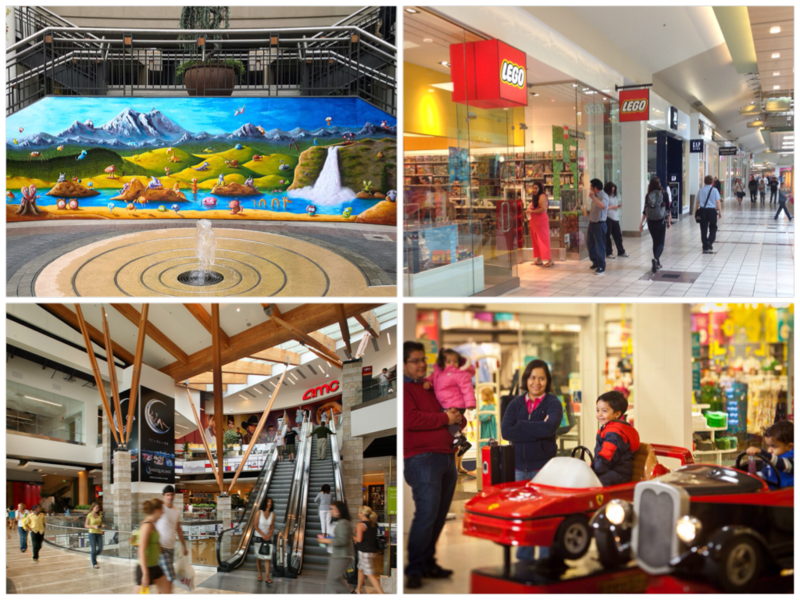 Or pop by the mall’s many other kid-friendly dining options, including Red Robin, Blue C Sushi, or P.F. Changs. Snag a treat at Pinkabella Cupcakes, Red Mango, Frost or the new Lolli and Pops which stocks unique sweets from all over the world. The Bellevue Collection offers few budget-friendly shopping options although you will find Bellevue LifeSpring, a fabulous thrift store, tucked away on the first floor of the mall, whose proceeds benefit local Bellevue families in need.